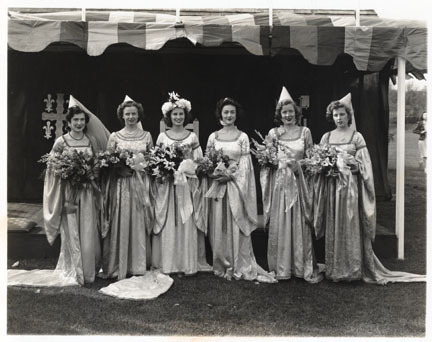 In the April 2010 issue, we asked for readers’ assistance in identifying the five young women pictured with Mary Lois Broomall Eberle, 1940 May Day queen, in the photo that opened the Class Notes section of the magazine. Several classmates—primarily from classes in the 1940s—enthusiastically provided their input on the identities of the young women who served as Eberle’s court. Based on their identifications and information from the College database, we now know that the women are (left to right) Patricia “Patty” Corya Langston ’42, Alice Robinson Smith ’41, Eberle ’40, Ruth Wilbur Stickney ’41, Margaret Ann “P.A.” Morgan Capron ’42, and Helen Connors Schell ’43.